Jack Huntley: bitter, cynical and betrayed in love. He believes women are devious, scheming, untrustworthy creatures – and when he rescues a naïve Miss from being raped, his life is about to change forever. There is something about Miss Foster that haunts him and challenges his emotions. But despite their growing attraction, Eulogy will not share her secret, which means he cannot trust her. Caught in a deadlock, both denying their true feelings, events take a sinister turn as someone seeks to silence Eulogy…forever. Grace Elliot leads a double life as a veterinarian by day and author of historical romance by night. Grace firmly believes that intelligent people need romance in their lives as an antidote to the modern world. Lynna, the sheltered and reclusive daughter of Frances wealthiest man, is sent from her home by the threat of kidnappers and straight into the arms of a lusty sea captain. During the time it takes to travel to America, to live with her aunt on a cotton plantation, Lynna learns more about the facts of life than she did in all her previous seventeen years. She learns that devilishly handsome sea captains are not to be trusted, best friends can also be your worst enemy, and, the most painful of all, that your own heart will sometimes betray you. 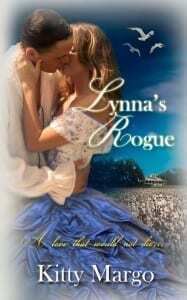 From the red clay of Georgia, to the tropical island paradise of Jamaica, Lynna goes from a life of every extravagance to a life of poverty,abusive men, betrayal and abduction by pirates. Yet, through it all, she maintains hope that her rogue can somehow be tamed and will realize, before it’s too late, that together they share a love that will never die. Mother of three, grandmother of four who loves to write in all genres, but historical romance will always have her heart. It’s 1865 and the Great Western Railway has spread across Cornwall, changing the face of the countryside with earthworks and viaducts. Now a new line is under construction. The invading army of navvies has many women but few wives. Considered heathens in a Christian country, they are feared by locals, ill-treated by the railway company, and a source of amusement for bored aristocratic ladies. This is the story of two men and two women of vastly differing backgrounds drawn together by corruption, intrigue, tragedy and courage. A professional writer for 35 years, Jane Jackson has had 27 books published. She has also taught the Art & Craft of novel writing at every level from post-grad to Ad Ed and Summer schools. Eight of her students are now traditionally published novelists. Married with children and grandchildren she has lived in Cornwall since she was two and cannot imagine living anywhere else. Passion will bring them together…but pride may rip them apart. Dashing aristocrat Evan Blake has seduced some of London’s most beautiful women, but he has one ironclad rule: never touch a servant, because she must say ‘yes’ or risk losing her livelihood. That rule is sorely tested the day Marian Willows comes to work at Blakewell Manor. Mischievous, smart, and independent, Marian challenges everything Evan thought he knew about women, life, and love. But reality cannot be ignored. Master and servant, aristocrat and commoner…even as passion unites them, society’s rules and the couple’s own prideful natures tear them apart. When Marian’s life is in danger, will Evan risk everything he has – his money, his title, his life – to save the woman he loves? Set in England and Paris during the years of the French Revolution, PASSION AND PRIDE is about illicit desire, forbidden romance, and a love that conquers all. Singing Heart unfolds in a beautiful English countryside in the mid-eighteen hundreds. Xzan Winslow, a very precocious child, the eldest of eight siblings, begins life in a home filled with love and laughter. Still a young girl a shipping disaster forces her to take on adult responsibilities to help contribute financially to her family. At the tender age of fourteen she is married to an older man who soon banishes her innocence and replaces her girlish fantasies with an inescapable nightmare of pain and loneliness that soon numb her heart and dash her spirit. When circumstances unexpectedly change and she is suddenly freed, she seizes her independence in a society dominated by men. Escaping on board a ship to America she ultimately meets a man who has literally haunted her dreams since early childhood. Jascarra, beloved medicine man to his tribe, is as shocked by meeting her during an Indian uprising as she is to discover that he is not a figment of her imagination. Both are unsure of why they have this psychic connection and must overcome not only the prejudice of their individual cultures to seek their own truths, but they must ultimately make the most profound choice of their lives. Surviving a grueling sea voyage, endless days and nights of walking and working in the heat, on the last lag of her journey, Xzan’s wagon train is assailed by the punishing winter chill which sets in earlier than expected. Despite severe fatalities, hunger, exhaustion and terror at times, the young woman pushes on, one foot in front of the other, determined to reach her new home, her safe haven and a job as a school teacher in the untamed west. Forging friendships that will last a lifetime Xzan Colby, finds true love and healing in the strangest of circumstances. Neither the plague, childbirth, tornadoes or even her addiction to laudanum can daunt this feisty heroine as she follows what she begins to realize is her destiny. Darlene Purcell lives in rural Oklahoma, is roommates with her amazing at any age mother, Peggy. Both adore their too numerous to take a head-count furry purrys, an overactive black giant pup who refuses to go home to his real family down the street, while striving to fulfill a bucket list that just keeps growing. Singing Heart is more than a moment in time. Its a genteel woman’s life from the early years. How circumstances shaped her character and her own hard work helped her fulfill her dreams against all odds. Its a spiritual story about life, death and rebirth of the spirit. About the loss of everything and how hope and determination allowed her to succeed against all odds. I have been reading and writing since age two. My life was solitary and lonely as a child on many levels and I turned within to the artistic part of my soul to keep myself sane. I read, wrote, became an artist, I play several musical instruments by ear, love to sing, craft. I have always been shy and reclusive and of course opposites attract so all the people in my life have been extremely social, including my daughter Crystal Xzan. She was truly a miracle in my life. When I finally wrote my first novel I was recovering from major surgery and bedridden for six weeks. The first two I felt so bored I couldn’t bear it I began to write more than poetry or short stories. Singing Heart threw itself on the pages and I was stunned, I felt like I was the instrument of a greater power writing through me telling this incredible story. I was as fascinated when I read the final full draft as my daughter was. Crystal was a little girl, eight years old when I finished it and she was so curious to read it. But it was a little too mature for her age group so it sat on disc, on a shelf for nearly 10 years before she asked again. She was enthralled with the story itself. There is some family history woven in the pages and as with every writer my characters are the best and worst characteristics of people, places, things I’ve known in my lifetime enhanced of course by my vivid imagination. Crystal begged me to try to get it published but life got in the way. I went through a divorce, her leaving the nest, my father becoming deathly ill with a brain tumor, diabetes, parkinsons, heart disease and alzhiemers and becoming his caregiver for six years. Then horrifyingly my only child…the light of my life left this world three years ago. I nursed her impotently, as she fought fought a monster that ate her alive and she was so brave it was humbling to be so helpless to save her. I am still traumatized and it feels surreal that she is gone. There are no words to express my grief or how empty this world is without her in it. She lived eleven months from the time of her diagnosis (stage four cervical cancer, given two weeks to live) and most of it she was in too much pain, too medicated to even stay awake. But in the moments when we were home and not in treatment long distance, when she was lucid and trying to face her own mortality, we made a bucket list of things she still longed to do making me promist to do as many of them as I could before I leave this world. At the top of the list, number one, she wanted me to publish Singing Heart. That was three years ago. She was 24 years old and I have just now come back to the land of the living. I’ve been in shock, paralyzed in time, unable to move forward until recently. Working like a drone going through the motions of being alive, feeling dead inside. In starting to cross things off that list I am coming back to life. I had a very wise daughter who knew me well and that what I would need the most to live without her was a purpose to go on. Singing Heart was published on Oct 4th, 2012 as an ebook for Kindle at Amazon. Some of those who have read it have given it five star reviews. I think my favorite was by Earnetta Fowler, she said that she loved coming home from a hard day at work to read it. When I was writing it, I felt such a sense of family and home. Even though Xzan the main character, had many homes in the book and her life was quite an adventure, she always maintained that feeling of love and care that makes a real home, was maternal to all of the around her, nurturing them. I would like to think that when all my readers read this novel they would not only identify with her as a person and her incredible pioneer spirit, but they would feel like I did while I wrote it, that there is no place like home and love means everything. Crystal told me before she left this world that she wanted me to spend the rest of my life writing more books. She was privy to the beginnings of several I never had time to finish because I was so busy working. She loved to laugh and I actually started a Southern Humor novel entitled “Yes Sir! Baby…” which I am working on finishing in 2013. She told me, perhaps this is the dreamer in her that she inherited from me, that if Heaven was everything we dreamed for it to be that it had to have a library in it because she loved to read. She wanted to believe that all the books I would write would appear in that library and she could read them and still feel me close until the moment in time that I would be there with her in person. I like to think that she is reading Singing Heart right now, cuddled up in her favorite chair, surrounded by all those I miss, including my father who followed her there six months later…I am at present writing a new novel that is a little different from any I’ve ever read, it has quite a punch line to knock the reader off their chairs. It too is set in the old west and it has some very real family (funny and naughty) history in it as well. SAM is going to be out in the early part of 2013. It soothes my broken heart to imagine that my darling daughter will be the first one to read it just like she did the others. It took me 18 years to have the time, the courage, the swift kick from someone who believed in me and was my greatest fan to share my soul with the world. I wish the whole world could read SINGING HEART and feel that love.